Are you feeling the squeeze? home > Newsletter > Are you feeling the squeeze? For families looking to gain a bit more living space at home, the current market downturn could benefit you in surprising ways. It’s never pleasant having to compromise your living arrangements because you’re short on space. Upsizing from a 3-bedroom to a 4 -bedroom house could be the solution. Perhaps two of the kids are currently squeezing into one bedroom. Maybe you need to set up a home office. Alternatively, an extra room can be great as a second living space or guest bedroom. Whatever your reason for needing some extra space, don’t let the current market conditions constrain your family’s lifestyle. While it’s true that Sydney prices have been a bit wobbly lately, real estate is complex. There are many different trends in different sectors of the market. You’re probably thinking that cooling house prices could enable you to pick up a bigger property for less. But at the same time, it also means you’ll earn less when you sell your current home – leaving you stuck in the same position. We analysed sales results during a six-month window in 2017, then compared them with the same dates in 2018. We dissected the data by number of bedrooms and found something very interesting: there are quite a few suburbs in Sydney’s Inner West where 3-bedroom houses have performed more strongly than 4-bedroom houses. In other words, average 3-bedroom house prices have either continued to appreciate, or have declined at a lower rate than average 4-bedroom house prices. Either way, the gap between what 3-bedroom houses are selling for, and what 4-bedroom houses can be bought for, seems to be narrowing in a number of suburbs. This means that if you’re considering upsizing from a 3-bedroom to a 4-bedroom house, now could be an ideal time for you! In the graphs below, you can see the gap between the blue and red trend lines is narrowing. This shows that for families looking to sell their 3-bedroom house and move into a 4-bedroom house, the market conditions are now more favourable. 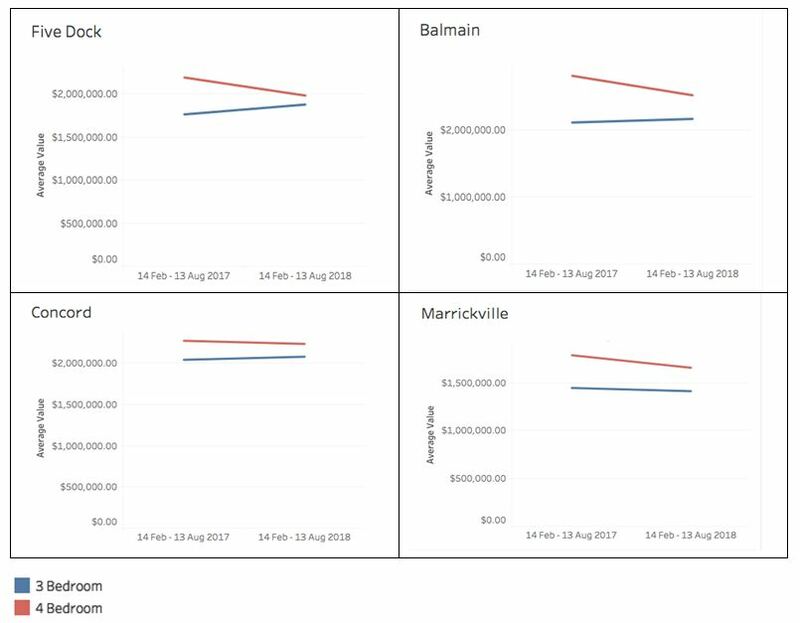 While this trend is not uniform across all Sydney suburbs, there are definitely areas where this is the trend. Don’t be pessimistic about your chances of upsizing to a 4-bedroom home. There are areas out there where a cooling market offers opportunities that perhaps you hadn’t considered. Best of all – when the market does turn around, 4-bedroom houses are likely to perform more strongly than 3-bedroom houses, giving you the chance to achieve significant financial returns! Speak with us at Devine Real Estate. We have unparalleled expertise in Sydney’s Inner West and understand the nature of the market. We can help you find solutions to your housing needs even during times when the market isn’t so strong.